Baloo the Bear makes his way through the streets of Davenport, Iowa, in a mid-'60s holiday season parade. Now that "Black Friday" is in our rear view mirror, I find it interesting that the Christmas shopping season of 1966 officially kicked off on Dec. 3. That was the day the Idaho Falls Chamber of Commerce had made arrangements for a parade featuring marching bands, majorette squads, beauty pageant winners, Santa Claus, and -- most curiously -- 40 giant balloons from Giant Balloon Parades, Inc. The mobile extravaganza was to begin at 9:30 a.m. on Memorial Drive in front of the LDS Temple and proceed to A Street, turn east on A to Yellowstone Avenue, then north to First Street, east on First to Holmes Avenue, then north on Holmes to the Country Club Shopping Center. More than 200 youngsters, most of them Boy Scouts, had been brought into service to pull the balloons (characters from "The Wizard of Oz," "Alice in Wonderland" and "Aladdin and His Lamp," among others) along the parade route. Some Googling reveals that Giant Balloon Parades was a company based in Newark, N.J. According to a 2006 article in the Quad City Times, Balloon parades were a hit in the '60s, the balloons were filled with air, not helium. They were mounted on big dollies and wheeled through the streets by costumed handlers. With a portable air compressor they had to be filled just to a pressure of about four pounds to the square inch. "If we put in too much they’ll blow up,” a company representative told Jim Arpy, reporter for the Times-Democrat in Davenport, Iowa. 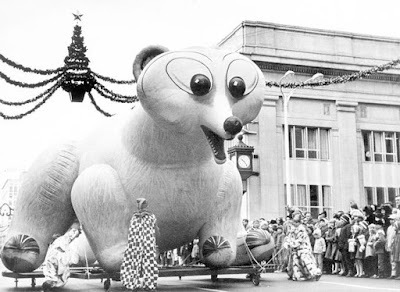 Anyway, I would be curious if anyone remembers this parade in Idaho Falls from 50 years ago. I can't imagine that it wasn't something to remember. It looks delightful! I would love to see this, or something similar/equivalent, re-introduced in Idaho Falls. Pocatello does Christmas so much better than we do.